Because... Christmas is around the corner! 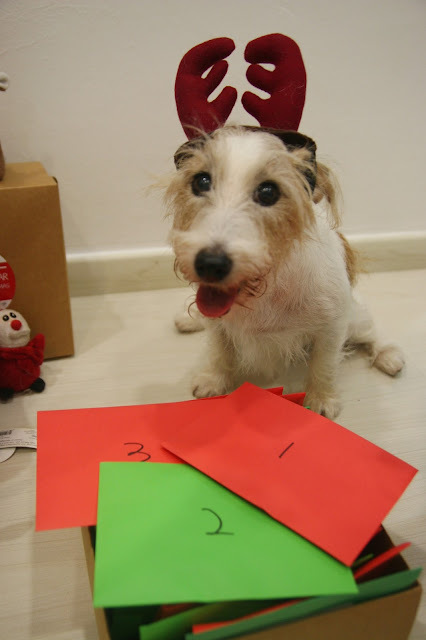 Awesome mummy decided to kickstart celebrations a tad early by getting us Advent Calendars from Barking Good! Thank you Auntie Dionne for delivering them to our doorsteps. Most of our stuff are in storage, hence, the pathetic setup. Anyway, we did what most people would do and googled the term "advent calendar". Turns out that it's a special calendar to count the days in anticipation to X'mas! And an awesome one is one that houses little gifts to be opened up each day! Gosh, why did we not learn about this awesome sh*t earlier??? We opened up the package and did a sniff test. As well as a thorough count to make that Auntie Dionne didn't shortchange us. Slight problem.. what comes after ten? So I decided to hold Santa hostage and get Mummy to do the counting for us. And woohoo, there were 25 envelopes!! Pecan ah ma was seriously super excited la. These awesome balls were made of salmon and tilapia! Since Mummy started a day late, we got to open two envelopes today! Turkey leh! Woohoo, how great is that! It's only day two and we are really impressed. Cannot wait to open the rest. To prevent us from cheating, Mummy had to hide the package in the fridge. At least we got something to look forward to everyday! Oh, on a sidenote, Pecan ah ma and myself are looking for part time jobs so that we can buy Christmas pressies for our loved ones. Auditioning for Santa's sleigh pulling job.